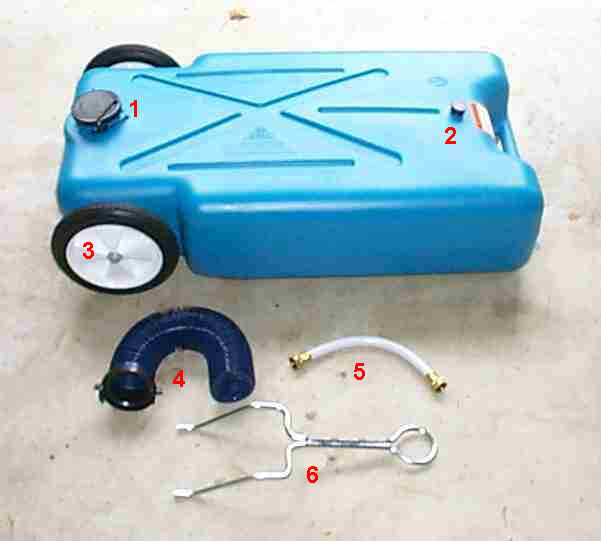 Also known as "Big Blue"
As Pop-Up Campers usually have a single tank which contains fresh water other methods of storage and transport must be used to safely dispose of it. Florida DOH amends policy on use of transportable wastewater containers and cassette toilets. Read all about it! Of course, the easiest way to dispose of gray water is to always camp on water/electric/sewer sites with the "big boys". The photo to the left shows the sewage drain on a campsite at Fort Wilderness in Walt Disney World. 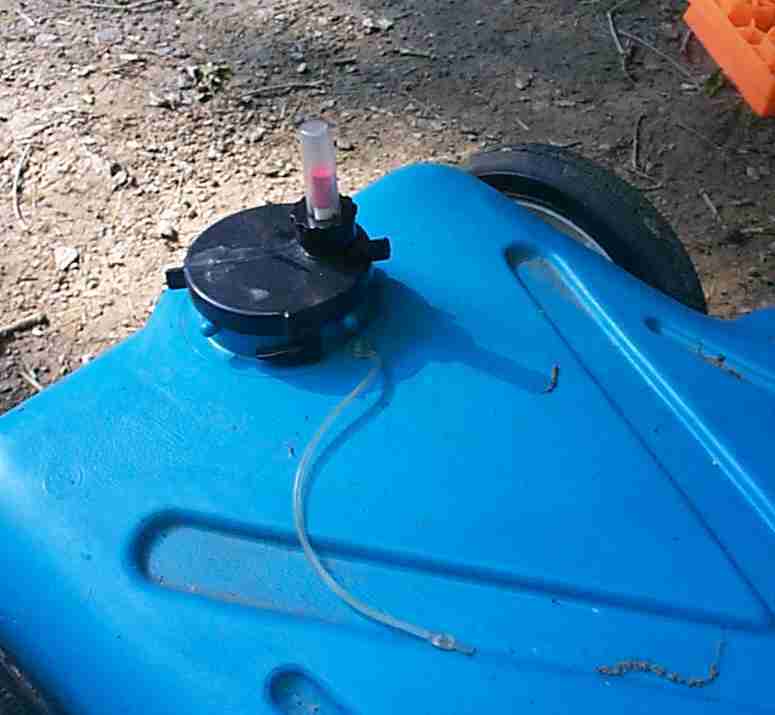 Simply run a hose form the gray water drain on your pop up (mine is pictured in the photo below) to the sewer drain on the campsite. Be advised that these sewer drain openings come in about 6 different configurations, so you may never know which one you are going to run into. 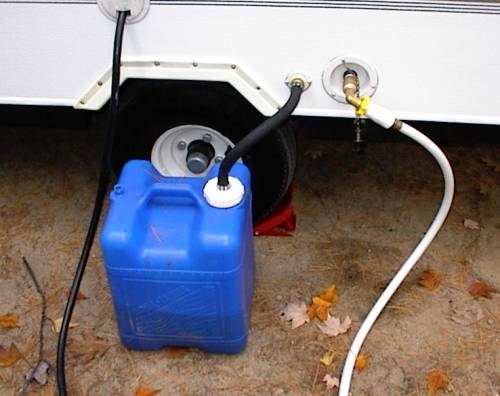 Drop by your friendly camping/RV store and they sell adaptors which will work with most systems. The gray plug in the photo is one of those adaptors that I always carry. Figure $10 - $15 to pick up the adaptors you need. For many years, all we used was a bucket to catch the water as it drained out of the pop-up. The photo demonstrates this method of containment. Unfortunately, unless you are extremely careful the bucket can overflow and/or spill while being transported to a designated dump site. 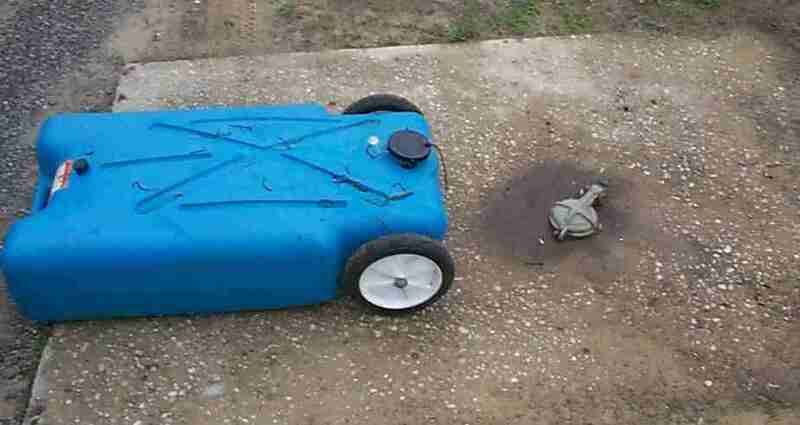 Check out Bill's Webshots page for more great information on his grey water system as it changes Bill uses 5 gallon collapsible containers. He describes them as inexpensive to buy, inexpensive to replace when they get grungy inside, easy to see when they're full since they're translucent, easy to store since they collapse and take up next to no room to store, easy to lift into the van for a trip to the dump station (no matter how far away it is! ), and essentially endless capacity by just having a couple of spares on hand! The photo to the left shows his original design which did not incorporate any venting. It should be noted that the usage of these types of solutions may not be approved in all jurisdictions. To the left is the gray water container Lee uses. it is adapted from a standard 7 gallon water bottle. Click on the picture to go to Lee's website! 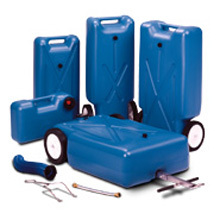 Gray water tanks are commercially available in many sizes to sit your waste water needs. Shown to the right are 5, 10, 15, 22 and 30 gallon tanks. All parts are standard and are provided by the manufacturer. 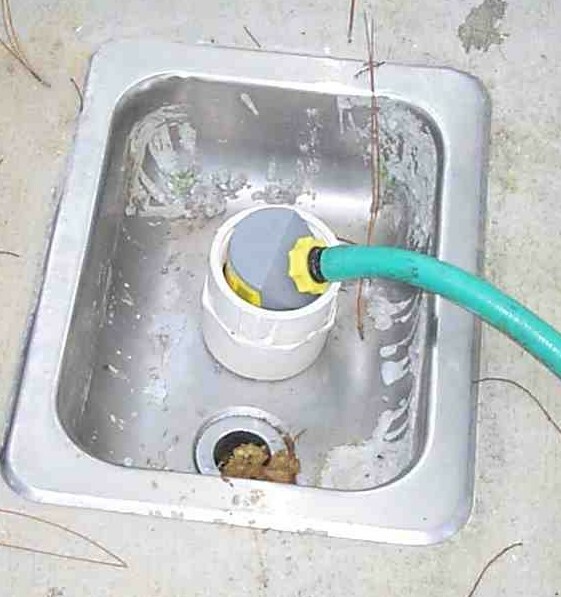 The photo demonstrates how to utilize the tank: loosen the drain connection (#1 above) slightly as an air vent and connect the fill hose (#5 above) between the fill connector on the gray water tank and the drain on the side of your pop-up. It should be noted that some pop-ups have this drain connection under the pop-up, not on the side. 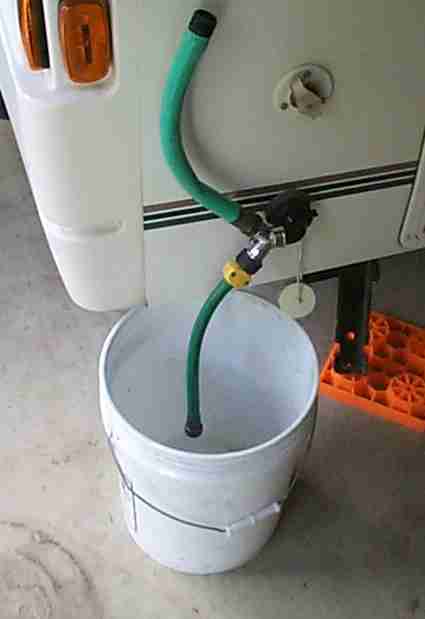 In 2004 I changed out the drain hoses from 5/8" garden hose to sump pump hose. You can check out my new "Gray Water Drain"
Some people find that the sink drains quicker if you place a "vent" in drain line. Use a standard hose "Y" adaptor and be sure to raise the vent sufficiently so that the drain water is not able to exit this hose. An accessory level indicator is available from Barker. This allow you to see the level of the gray water without having to open the container. 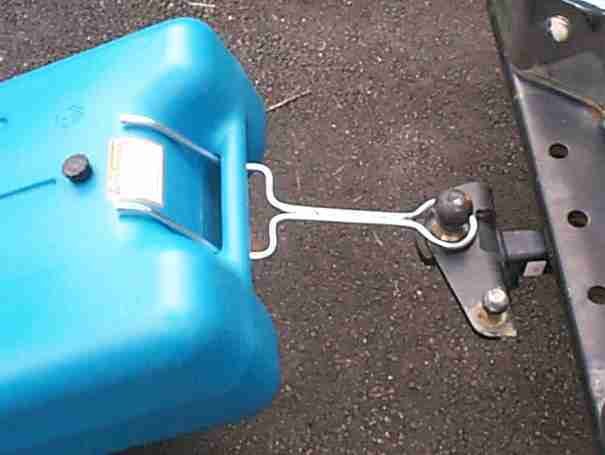 The supplied trailer hitch adapter slips into the handle of the gray water tank and then over the ball of your trailer hitch. 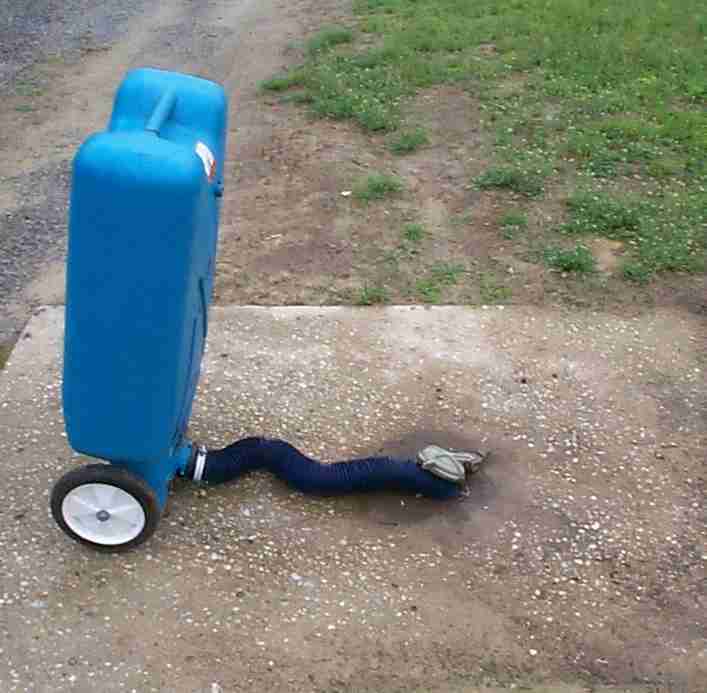 You should not drive over "walking" speed or damage may occur to either the tank or wheels. You should transport in a manner which will preclude the leakage of the contents of the tank. Be sure that BOTH caps are secured prior to moving the tank! Once full, or at the end of your camping trip, transport the tank to a state approved waste disposal site. Set it down as close to the dump as possible. 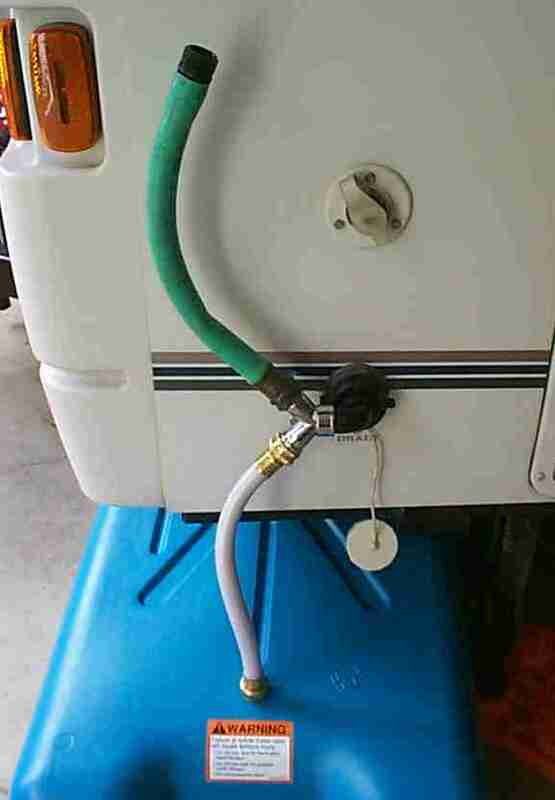 You then attach the 4" drain hose, place the hose in the dump station and raise the tank to drain it. You may need to loosen the smaller cap to allow for air venting. NOTE: The area around the dump station is usually not the cleanest in the campground. Try to keep out of any standing water and keep children away. Remember to wash your hands after this activity. These tanks should only be used for the storage of what we would consider "gray water". This includes water from hand washing sinks, kitchen sinks and showers. They should not be used for the storage of toilet waste. Purchase and use an approved porta potti for toilet waste. Should a spill occur, immediately notify park management so they can take action to disinfect the spill area. Remember, other campers will be using this camping area after you leave. They are entitled to a clean and safe environment for their entire family. Some people complain about transporting the gray water containers, but with a little thought a "home" for your container can be found. 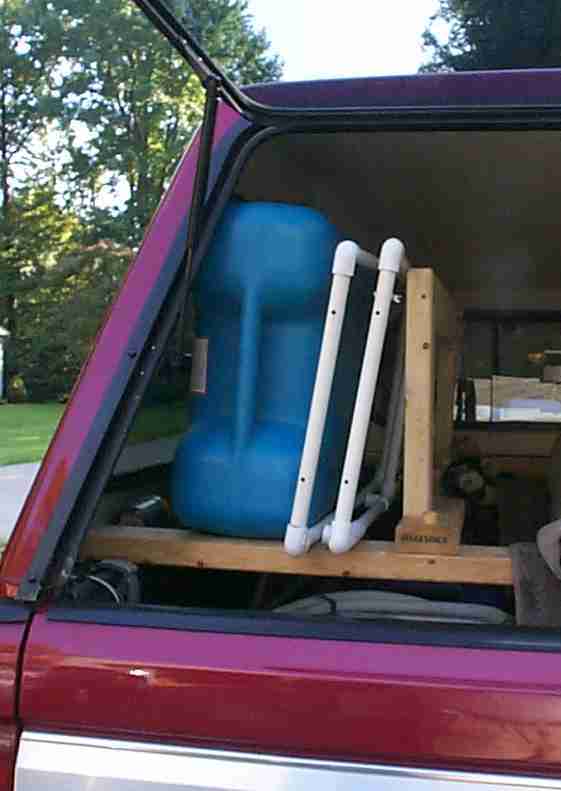 Bill has constructed a compartment in the rear of his van to carry the 22 gallon tote. 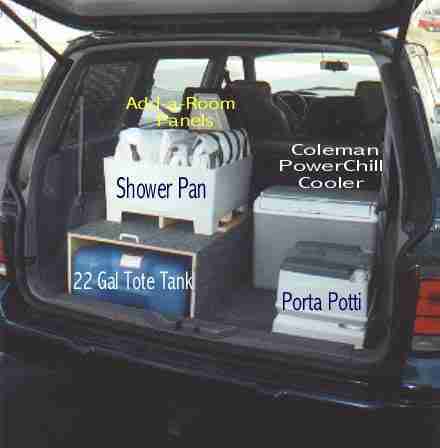 He also added a shower to his Santa Fe, and the shower pan is shown in its home above the tote tank storage. Other items are labeled. I have the luxury of space in the bed of our tow vehicle. Here you see I have added a vertical brace to my rack system to support the gray water container and my shower stand (that's the white PVC thing). 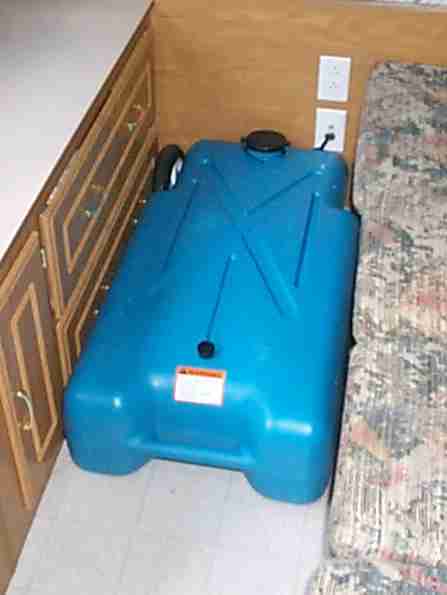 If necessary, I could transport even the 22 gallon gray water tank in the aisle of my Santa Fe. If you are going to transport this way, measure your aisle before you buy the tank. Measure the tank at it's widest point to see if it would fit. On my tank the widest point is the hubs on the ends of the tank axle. If I were going to transport this way these tips would need to be padded to keep from rubbing in the cabinets during transport. When you measure the aisle, remember to take restricting items into account like drawer handles. 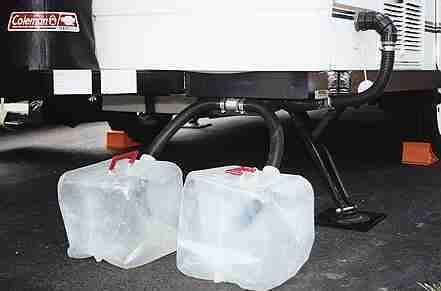 Gray water is a term which is legally defined state by state as well as a term used by the RV industry to identify the contents of one of the two waste tanks on onRV. Thus you have numerous "definitions" of what gray water is and depending on who is speaking it can make a big difference. Confusion arises because the RV industry considers kitchen sink waste "gray water" while the EPA and most state health departments consider it sewage. To add to the confusion many communities advocate the practice of reusing/recycling gray water for landscape use. Do not let this confuse you, when talking about gray water recycling they normally exclude water from a food preparation sink. This is similar to most state laws I have read on the issue and I point out that they exclude water from a kitchen sink. Well, if it is not gray water what is the water that comes out of your sink? It's legally sewage! As it has been explained to me kitchen sink waste contains solids including grease, and food particles that are not normal found in the wastewater from a hand washing sink. When you think about it, kitchen sink waste is the majority of the water from a pop up. Many pop up campers moved up from tent camping where washing the dishes in a pan and then dumping the water in the bushes is common and accepted practice. But, when we deal with the issue of dumping gray water on the ground from pop ups we can't look at the discharge from a single camper, but the combined discharge of all the campers who will use a single campsite over a camping season or longer. 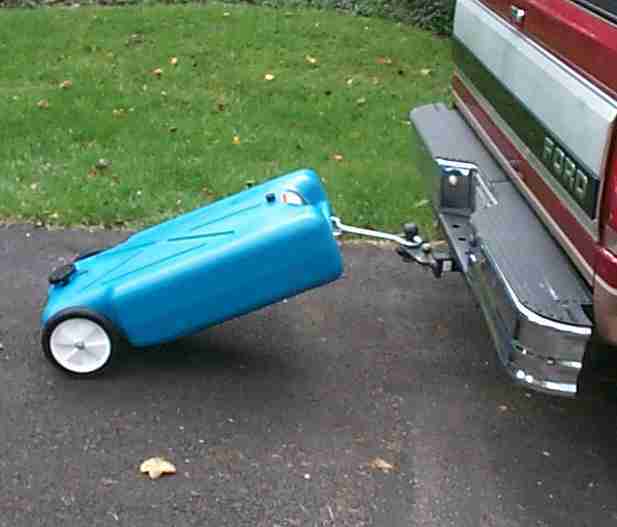 Many people feel "soapy water, in moderation, actually helps in soil emulsification", which is technically correct, but there is a difference in the amount you may spray on your lawn and the amount 40 or 50 campers will dump on a single campsite over a season if they don't collect and dispose of it properly. Without gray water containment we will have a concentration of soap and other residues dumped in a very small location.